The Midwest is an awesome place to be if you love to run and have a good time in the process! In researching the various types of running events I have reached out to race directors to find out what happens behind the scenes as these events come together. With the popularity of relay events I was interested to find out how they differ from solo events. 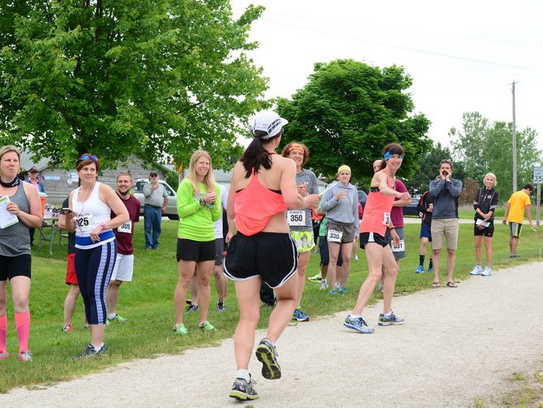 Race Director Melissa Dupke of the Ahnapee Summer Solstice 50 was kind enough to oblige my numerous questions about the event she manages in the Door County area. Q: In what year did you start running? I started running regularly in 1997. Q: How did you come up with the concept of running a relay event along the Ahnapee State Trail? The Friends of the Ahnapee group had tried to hold a bike ride on the trail as a fundraiser, but our growth was stagnant. So, we brainstormed with Randy VanStraten, Bellin Run coordinator, along with Sean Ryan of the Fall 50, and we came up with the Ahnapee Summer Solstice. Q: How does a relay differ from a solo run event? A relay allows teams to form and share the mileage in whatever manner they choose. I have seen quite a variety of methods, from teams that have their runners do multiple legs back to back, to teams that have tried to go mile by mile so they can be “faster”…I have not seen that method work out very well for many teams. Q: You recently finished the Hilloopy 100 relay. How does it compare to Ahnapee Summer Solistice Relay? The Hilloopy 100 is it’s own animal…running the same 5K course repeatedly offered pros and cons – the runners became very familiar with the course so it was easier to game plan each lap, but it also gets somewhat tedious as you face the same hills over and over. The Ahnapee Summer Solstice has its pros and cons as well. It is a very flat course, so it’s pretty fast, but it is also very straight, so the runners can see a long way out and that can get to be mentally challenging. It’s nice to be able to see your competition on both courses, though, as it gives runners something to shoot for! Q: How do you feel about all the relay events that have popped up recently? I love the fact that the relays are growing in popularity! I think it really is a fun way to bring together large groups of runners collaboratively, and it builds that sense of camaraderie among teams and competitors alike! Q: Why do you feel recreational running continues to grow? That’s an interesting question, because there has been a real shift in the types of runs that folks are gravitating toward. We are seeing more growth in team type events like the Spartan and Tough Mudder series, where just finishing is the goal. Competitive, individual running events are still very popular, but they, along with competitive triathlons, have seen something of a decrease over recent years. Q: As a race director what is the one thing you think the running community would be shocked to learn that happens behind the scene of an events such the Ahnapee Summer Solstice 50? Huh…I think it is just all of the networking that has to take place to create the overall experience for the runners. We really want them to have a positive experience out on the trail, so we work very hard to bring in great volunteer organizations to help out. We also do a lot of work with local establishments to provide runners with a “taste” of all that Door and Kewaunee Counties have to offer on the culinary side of things. Q: What are few interesting sites along the course of the Ahnapee Summer Solstice 50? The route follows the old Ahnapee and Western rail line and goes through a wide variety of landscapes. In the early miles, runners pass through a low area I like to call the Everglades of Door County. We often see waterfowl in this section. The crossing at Maplewood is a popular location with Richard’s Bar just across the road from the exchange zone! In Forestville, runners are treated to views of the Ahnapee River from the pond above the dam, all the way to the bridge crossing in Kewaunee County. Bridges are another feature that give our trail an ahh factor. In the Casco Junction area, there are two spans over the Kewaunee River that are just beautiful. Bald eagles are often spotted in this section along with deer, foxes, and owls. 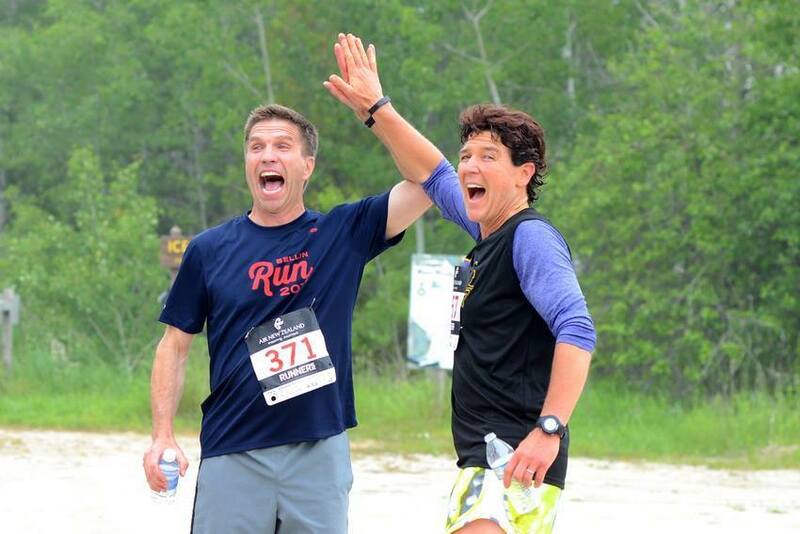 Q: What type of post race events happen after the Ahnapee Summer Solstice 50? 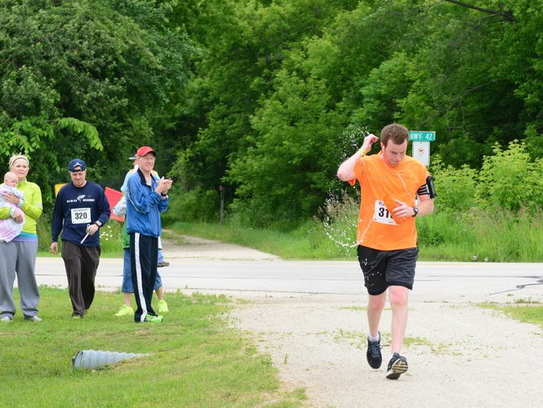 Runners finish at the entrance to the Kewaunee County Fairgrounds in Luxemburg. The finish line offers teams a great opportunity to cross the line together for that team victory photograph! Once across the line, teams are treated to all they care to eat and drink. A wide variety of food and beverage options are available, from local pizzas, subs, and cheese products, to the ever popular craft beer selections from the Ahnapee Brewery and wine from the von Stiehl Winery of Algoma. Q: What was the biggest challenge you faced getting this race off the ground? 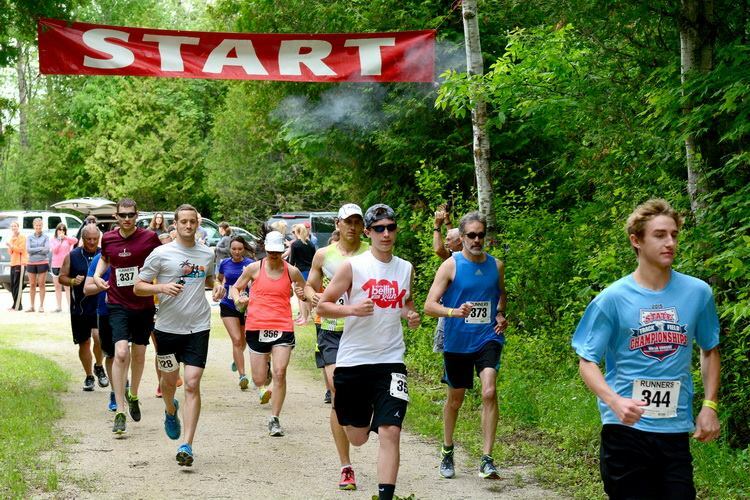 I think the biggest challenge is finding the right date…there are so many great events taking place in and around Northeast Wisconsin, and finding that weekend where our race is the “go-to” option has proven to be difficult. Q: Any suggestions you can provide for teams to maximize their efforts during a relay event? Come into the event with a game plan, but be prepared to be flexible! Anything can happen, and having a backup plan can be the key to finishing! Q: Tell me about the NEW solo options this year. This year, we have added both a 30 mile and a 50 mile solo option. Runners will be able to choose their distance and there will be a mid-race cutoff time that will be enforced to help ensure that all runners are able to finish by 6:00 pm. We have the luxury of being able to offer both distances with the same start finish, thanks to our unique layout that gives runners and teams the option to choose the long or short version at the 26 mile mark. Q: Any plans to expand the event in the future and add a solo 50 mile option for runners? We are offering the 50 mile option this year!! Q: For runners coming into the area for the race, what are a few things they should make sure to see/do while in the area? Lake Michigan is beautiful and we have a variety of vantage points from Kewaunee all the way up to Sturgeon Bay. There are a number of small parks to visit, including Blahnik Park, Bruemmer Park, Lasalle Park, and more! Door and Kewaunee Counties have seen a large number of small wineries and craft beer breweries pop up in recent years, so a wine and/or beer tour may be desirable for some! There is a race track in Luxemburg, where thrill seekers can get their fill of fast cars and exciting finishes on Friday night. In addition, there are a wide variety of unique restaurants throughout the area. The beautiful course and fun group of people will not disappoint. 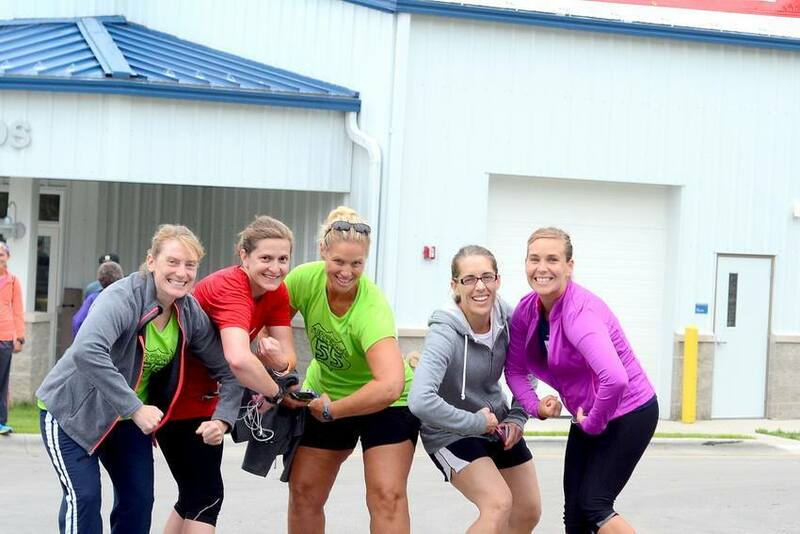 There is still time to register for the Ahnapee Summer Solstice. Start 2017 with a bang and start training for a solo or relay event!